As some of my internet friends on the Rubenerd Forum pointed out and as I talked about on Rubenerd Show 179 (Fri 17/Nov/2006) there have been some problems with viewing the Rubenerd Show, Rubenerd Blog and Rubenerd Forum with Internet Explorer. I really don't have an excuse other than I use Mac OS X without Interent Explorer and I forgot to even test the sites in it. Big whoops! 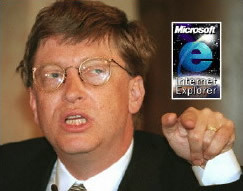 While I encourage people to try alternative web browsers such as Firefox, Flock, Camino and Konqueror, I understand some people still have to use Internet Explorer in the workplace where they don't have a choice, and I apologise for leaving you out. Unfortunately the forum still looks like rubbish in Internet Explorer for some unknown reason, even with the latest update and the latest default theme! I've registered with the Vanilla site so I'll be posting a question regarding this and will try to fix this tomorrow. For now it's 3:00 in the morning so I really need some sleep! If you can see any further problems let me know by posting a comment here or creating a new thread on the Rubenerd Forum. In particular I'd like to really thank my old room mate enaurore (aka Kevin), surrealist (aka Matt) and Mr Bunny (aka Dave) for bringing my attention to these issues. Newer post ← Rubenerd Forum Finally Fixed! Older post → Secret Youth Tobacco Ads on YouTube?